In the early 1500s, Henry VIII established Royal Dockyards at Woolwich on the Thames downstream from London. The Dockyard naturally included naval weaponry stores. In the late 1600s, Charles II bought more land at Woolwich for use as an ordnance depot. The earliest surviving buildings of the arsenal date to 1696 when a facility for making ammunition was built. In 1717 the government completed the Royal Brass Foundry to cast artillery. The arsenal expanded greatly over time and was in operation until after World War II. Although there were plans to demolish the arsenal, it is now subject to redevelopment and preservation projects and will include historical, residential, and commercial sections. For more information on the arsenal, please see the excellent Royal Woolwich Website. It inspired me to visit Woolwich and is a great source of information, photos, and maps of the site. Unlike today, not just anyone could walk right into the arsenal. Like modern military facilities, the work of the arsenal was secret so a brick wall enclosed the facility. The Main Guard House on the left was built in 1788, conveniently near the entrance. 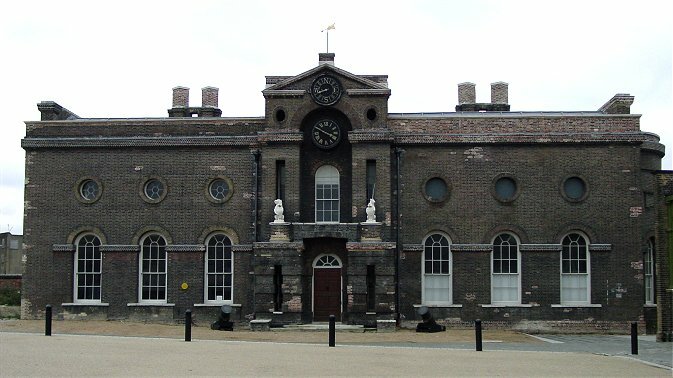 Both it and the Royal Brass Foundry are now used as office space by the National Maritime Museum. Not visible, the old Royal Military Academy building is beyond the Royal Laboratory building. Royal Laboratory - 1696 These earliest surviving buildings were used to manufacture ammunition. Royal Brass Foundry - 1717 Here, cannon were cast from molten brass. Dial Arch Square - 1720 Guns were machined, bored, and engraved here. Verbruggen House - c. 1772 Constructed for master foundries Jan (or John) and Pieter Verbruggen. This is the view from the river. 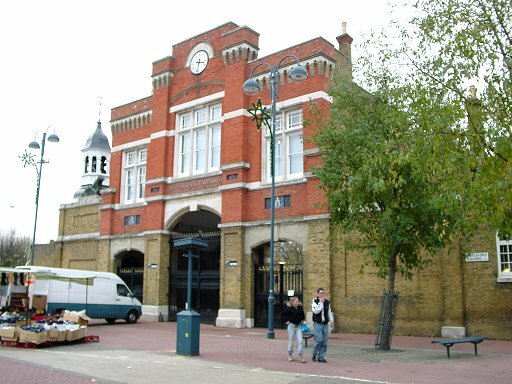 The Firepower artillery museum is located in the old Royal Cartridge Factory. They plan to open a new addition across the street at Easter 2004 in Laboratory Square, or the Pedimental Building, which was built between 1805 and 1810. The octagonal Guardhouse by the river dates to around 1815. Up the river you can see the Millenium Dome in Greenwich, the Thames Barrier, a flood protection scheme, as well as recent buildings north of the Thames. Because prisoners could no longer be sent to America after the revolution, prisoners were kept in hulks in the river off Woolwich. Built in 1720, this building was headquarters of the Royal Artillery. From 1741 until 1806 it was the location of the Royal Military Academy, which trained officers for the Army and the East India Company. Originally built in 1829 as an improved entrance, it was altered later and is now separated from the rest of the arsenal area by a busy road. http://homepages.ihug.com.au/~dispater/cannons.htm Details the Verbruggen story. http://www.royal-arsenal.com/ More info on the site.